Replacing the football field and running track at Killdeer High School was necessary because the existing asphalt track was built in the early 80’s and needed reconstruction. Overall, the field has been in service since the early 70’s so an update was necessary. Fisher Tracks designed the track and field for this project. 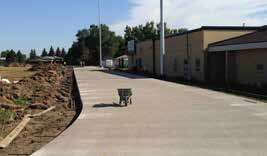 They chose to do a post-tensioned concrete track base as opposed to asphalt due mainly to subbase and soil issues. Post-tensioned concrete tracks are a patented process that allows an oval track to be constructed under compression at every joint. Each of the cables is tensioned to 36,000 psi. The total yardage for the track is 3,660 square yards with 24 tensioning boxes for pulling the cable. The high jump pad is post-tensioned as well. 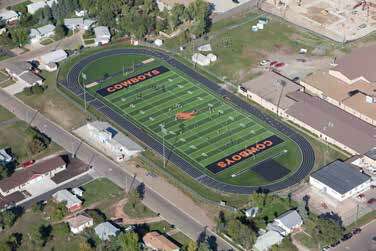 It was Killdeer School’s intent to have a turf infield, but turf needs a concrete border for it to be completely secured. With turf, a concrete curb has to be built the entire length of the inside of the track. By going with the concrete post-tensioned track, the need for the concrete curb was eliminated. Also constructed were the event areas such as the high jump pad, pole vault runway, and dual long jump and triple jump runways, all of which utilized cast in place concrete. The final work on the track was the polyurethane base mat and the red structural spray track system as a surface treatment. This amazing facility meets all of the world-class competition requirements, and the completed project gives Killdeer a first class competition track facility and a fantastic football venue.